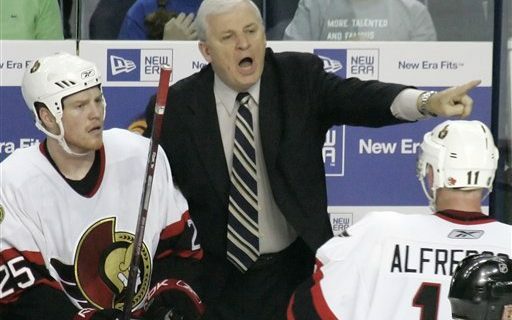 Longtime NHL coach and executive Bryan Murray passed away on Saturday at the age of 74. By all accounts, he was a well-respected, well-liked hockey lifer. But in Buffalo, he was a legendary sports villain. Like Bryan Cox, Louis Oliver, Tom Brady, Tie Domi, Jamie Macoun and Brett Hull. It was nothing personal. It was sports. Murray is partly hated because of the rivalry between his Ottawa Senators and the Sabres. But mostly because of one hit, one fight, one screaming match with Lindy Ruff during a game in 2007. It was the heat of the Sabres-Senators rivalry in the mid-2000’s. Both teams were good. Both teams were battling for division titles and Eastern Conference supremacy. It all boiled over when Senators tough guy Chris Neil blew up Sabres captain Chris Drury with a dirty hit, a high shoulder blow to the head. Ignoring the rising heat in the HSBC Arena, Murray sent out his scoring line right after the hit. Ruff responded by sending out his rough and tumblers, led by Andrew Peters & Pat Kaleta & Adam Mair. That led to a memorable night Sabres fans will never forget. Ruff and Murray screamed at each other, both blaming each other for escalating the issue. From that moment on, Murray would forever be a Buffalo villain. It didn’t matter what he said, or if he even intended to create the situation. It was Murray’s team, he screamed at our coach, and he was to blame. That was enough for us to put him on our list of hated sports villains. In the many tributes you’ll see to Murray in the coming days, this brawl won’t be mentioned. It was an insignificant moment in a great career. But in Buffalo, this moment, and Murray’s role in it, will never be forgotten. Rest in Peace. Our memories, and your role in our city’s sports history, will never die.